Valuation: The one “examination” that has the single greatest impact on your financial future. There are many uses of a practice valuation — are you ready for one? Most doctors know that if a practice transition is imminent, for example a sale, or if a partner or associate is about to join the practice, then a valuation is necessary. But not everyone realizes that a valuation is also recommended for practices undertaking a business plan or identifying the appropriate amount of insurance or for prudent financial planning. By the way, once an investment is made in a well prepared valuation updates by the same firm are generally simple and the fees are reasonable if update annually or biennially. You want a well thought out approach and highly qualified valuation firm to perform your valuation — we’ve found one for you. As in any profession, not all valuation providers deliver the same level of service. You want a qualified professional, who gives careful attention to the analysis, to give you confidence in the work product. Many use a shallow “rote” methodology which is not flexible enough to recognize unique aspects in many practices and may not apply to specialty practices. Using this approach, you would risk having your practice undervalued or overvalued. 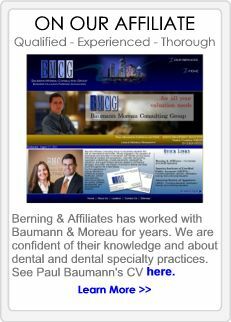 Berning & Affiliates has carefully reviewed established practice valuation firms and has selected Baumann Moreau as our affiliated firm, specifically for dental practice valuations. 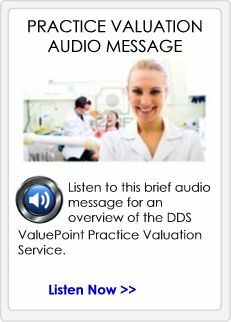 Our valuation affiliate applies recommended valuation methods outlined in the ADA publication The ADA Practical Guide to Valuing a Practice and AAO Guidelines on Valuation utilizing the capitalized earnings method. This is the method that has stood the test of time for service based businesses and you can get the benefit of applying it to your practice. By the way Paul Baumann along with Randall Berning co-authored the ADA publication noted above. 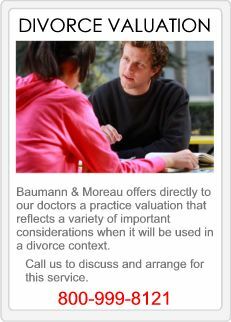 How can we help you expedite your Practice Valuation? Berning & Affiliates acts as your administrator — we handle the details for you, beginning with providing you with a quote. Once you engage services, all you do is complete the data collection form and provide the requested documents. Your valuation will be ready in 30-45 business days from when we receive your materials. 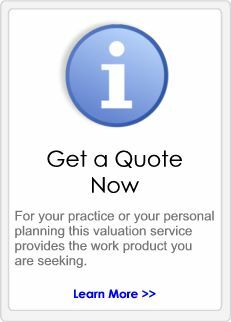 For pricing and other information about a valuation for your practice, click here to submit your request for a valuation quote, or call today at 800-999-8121.